It all started with doodles -- on the back of a page schedule of a major national magazine. Lisa Ferber -- lowly copyeditor by day, fearless writer by night -- needed a creative outlet while she waited hours and hours, for the final pages of Men's Journal to arrive on her desk for final changes. Instead of tapping her foot, pacing or chatting on Skype, she grabbed the closest thing to her -- the "bookmap" or schedule of pages -- and started drawing. People, places, things and Woody Allen-esque New York social milieu from growing up Jewish on the Upper West Side, all came to her faster than words could formulate in her brain. While never having the intention of substituting drawing for writing, Ferber nonetheless found that when her elderly mother became terminally ill, the lifelong playwright, lyricist and story author couldn't put words to paper. So, she picked up a paintbrush and added her own editorial flair to the pieces: captions. Weird captions, hilarious captions, captions that border on the absurd. The 40-year-old who had experimented in every type of art form had found her niche. "When I realized what was going on, and that I would be her caretaker and that things would only get worse, my head was exploding, and I couldn't write anymore because my mind was too full," said Ferber. "But I have this unstoppable creative force in me that needs to get out, all the time. "My juices are always flowing and I'm always ready to go, so when I realized I couldn't write, I knew it wasn't that I was blocked in the regular sense, but I was just overwhelmed, and I needed something." As it turns out, Lisa Ferber isn't the only writer who sheds one creative skein for another. On December 6, all was featured at the annual Holiday Show, from the National League of American Pen Women at the National Arts Club with Ferber sharing the stage with artists and writers including Myrna Harrison Changar, Michele Bonelli, Rhoda Greif, and Julia A. Rogge. Ferber will show three pieces completed this year: "Alexandra Considered Her Teacup Collection, which features a glamorous woman alone, thinking deeply about her teacup collection; "Undeterred by the boisterous businessmen, Linda and Lisa enjoyed a most splendid evening at the 21 Club," a self-portrait of Ferber and a friend at the famed speakeasy; and finally, "Avi Never Forgave Shmuel for Winning the 3rd-Grade Spelling Bee," a reminiscence on a seminal moment in Ferber's Manhattan elementary school. A native of the Upper West Side and the only child of Jewish immigrants, Ferber never had a notion to paint as a young child, but once the doodle happened, her secondary artistic career took on a life of its own. After her first sale at the National Arts Club, a colored pencil piece, They Found Her Delightfully Bohemian, a friend recommended Ferber try pen drawings, of which one sold on the street to Jimmy Roberts, writer of I Love You, You're Perfect, Now Change while Ferber was walking to the copy shop to get it scanned. "It's funny that it's all started so recently, making art, because it feels completely natural, as though it's been there my whole life and just needed to wait until the right time to start coming out," Ferber said. That right time could have simply been a matter of Ferber learning economy of word and scale -- through copywriting. 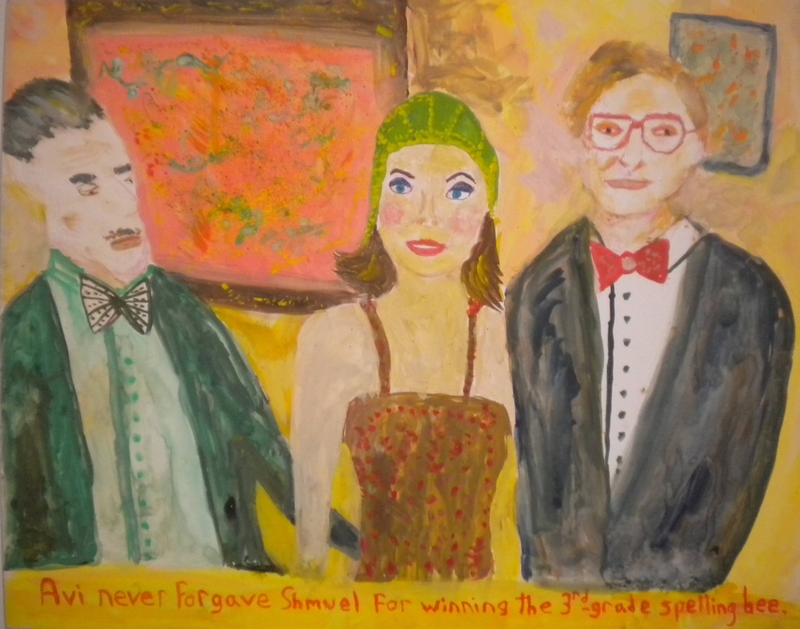 Though the handwritten caption on the paintings are the elements that distinguish original Ferbers from other paintings of her genre, the copyeditor -- who has performed her works at such renowned writers' haunts such as the KGB Bar and the now defunct "Zipper Factory" -- started without them. "But I actually came up with the captions idea because my earlier drawings were a lot more cartoonish so it made sense. I thought, hmm... Maybe I should try it. I love words. I've always loved words. When I was little, my father would play Scrabble and Ad Lib with me, and, I must say, I won the spelling bee in third grade."